Seven months before the Dr. Phillips Center’s debut, officials presented a green vision for the city-block-sized space between Orange and Magnolia avenues, leading from City Hall directly to the gleaming new arts center’s front doors. But the green space hasn’t come fully to fruition, marred on one side by the slow-motion demolition of the Round Building. And plans are moving forward to erect a pair of towers on the block, each taller than the arts center. Why build on the space instead of leaving it green? City officials say the long-planned buildings — a hotel and an office tower — will bring revenue to the arts center and people to the plaza, which was never intended to be a lawn. “It’s always been understood that the towers would be there,” said Dean Grandin, head of the city’s planning division. According to Cassandra Lafser, spokeswoman for Mayor Buddy Dyer, the city has had an agreement for more than a decade with CNL Dickinson Ltd. to develop the parcel that used to house the Round Building. Plans for the hotel and office building came into focus in recent months. In March, a team of developers submitted plans for an eight-story boutique hotel, possibly a Hilton Curio, on a parcel at the north end of the site. 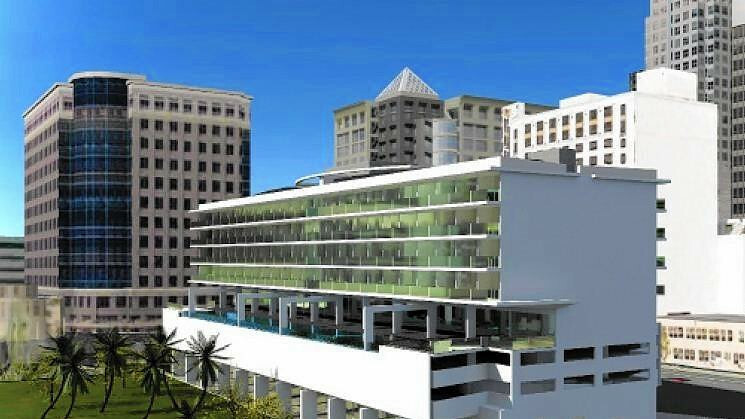 The proposal called for 155 rooms, with balconies and rooftop bars to overlook the plaza. CNL revealed plans earlier this month for a 10-story building housing 250,000 square feet of office space on the south end. Pugh said the towers will allow the space in the middle, Seneff Arts Plaza, to become the “living room” he spoke of, because the city has stipulated both buildings must “activate” their ground floors with places to shop, walk and eat. Jay Jurie, an associate professor of public administration at the University of Central Florida who specializes in urban planning, expressed skepticism over the need for more hotel or office space downtown. Reports indicate a 16.3 percent vacancy rate for downtown Orlando’s office spaces, higher than in surrounding areas. Jurie also questioned whether an office building is a good fit next to an arts center. But Rick Geller, an attorney and board member for Bike/Walk Central Florida, said the towers could prove a bigger draw than green space if their ground floors offer attractive options for pedestrians. The renderings released so far are not finalized, and plans are a long way from approval. Currently, city staff is negotiating a lease and other agreements for the hotel site, according to Lafser. CNL’s 2004 development agreement with the city, which includes an option to buy or lease its site, expires the last day of 2016. The rent will flow into the arts centers’ coffers, officials said. Pugh said the money, essentially an annuity, will help fund operating expenses and building maintenance. It’s a worthwhile trade-off, Pugh said. “Does it take away a little bit, visually, from the center? “Probably a little bit,” he said.